Travis Scott, a chart topping rapper and A-list celebrity, put on a one day music festival on November 17th in Houston. Music festivals are a common thing nowadays, so Scott took the initiative of catching people’s attention and creating something unique for his fans. 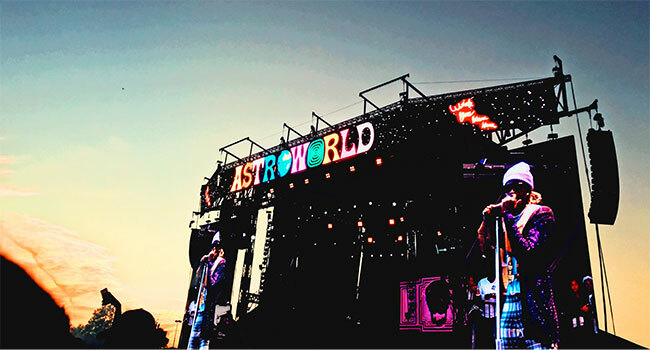 His latest album, named AstroWorld after the shut down amusement park, was the theme of this music festival, hence the location at NRG park, across from the lot where Astroworld once stood. Scott announced the festival back in August, and stated it would be a day glorifying the city of Houston, and “bringing back” AstroWorld. Travis Scott used three things to accomplish his vision: anticipation, creativity and electricity. Scott used anticipation, by leaving fans waiting to find out basically anything about the festival. Although this was a bold move, it worked in Scott’s favor as general admission tickets were sold out just by the power of his name as the headliner. Scott didn’t release a lineup, or information about what would be there. Fans, eager for information, and with increasing anticipation, helped Scott draw attention leading up until the day of the festival. Travis dropped the lineup on his social media only the night before, and set times only the morning of the show. The star-studded lineup included Texas natives, such as Post Malone and Lil Wayne. His openers for his full tour had also made appearances during the day, including Gunna, Trippie Redd, and Shek Wes (famous for his fan favorite Mo Bamba). Other performers included Young Thug, Rae Sremmurd, a budding group called the Houston All Stars, and even more. It was safe to say that Travis Scott had put together a strong lineup. Saying Scott used creativity to plan AstroWorld would be an understatement. At the gates of the festival, there was a massive inflated face, as seen on the cover of his album and a huge colorful sign welcoming you to AstroWorld. Among the festival grounds, there was not only a lively “AstroDome,” but multiple rides, games, large structures of art, and music to be heard. The 350 foot acre property was alive at any standing point. Carnival games, all named after Travis Scott’s songs, were able to be played by festival-goers, with a prize booth full of merchandise. The art popped at every corner from the rainbow signs, graffiti portraits, fun-house mirrors and bright lights. To top it all off, Scott included rides to emphasize the theme of his beloved AstroWorld with a LED lit Ferris wheel, skyscraping swing ride, and a thriller drop tower. All of these rides not only were enjoyable for fans, but gave you a clear view of the entire festival grounds, along with the Houston skyline. Scott’s creative designs and the energy put into the whole day proved that this wasn’t an ordinary concert. But all the planning in the world wouldn’t mean a thing if it didn’t come together on the day of the show. However, it exceeded expectations. People arrived and crammed the gates in mass numbers, even breaking down the gates upon entry. As a member of the audience, I can tell you that every movement on stage was enticing and electric. Every name on the lineup proved themselves to live up to the same level as Travis Scott. However, the man of the night had completely stolen the show. With over 35,000 people fighting to get as close to him as possible, Scott found a way to excite every one of them throughout his performance. Stunts such as an on-stage roller coaster and the dizzying graphics behind him took his hour and a half show from a concert set to a full on performance. Every beam of light, buzzing sound effect, blast of music, or jump of the crowd, sent a mass jolt of electricity through your body. He finished the night off with “Sicko Mode” and explosive fireworks to leave his fans with the same feeling. Scott used his music and ideas to send the same electrifying power through the crowd, making them feel something with him, and portray his image of AstroWorld. Kaitlin Lowe is a student and frequenter of the South Florida music scene. From a young age, Kaitlin has taken a major interest in both music and journalism. Kaitlin is a part time intern at Sound Royalties.